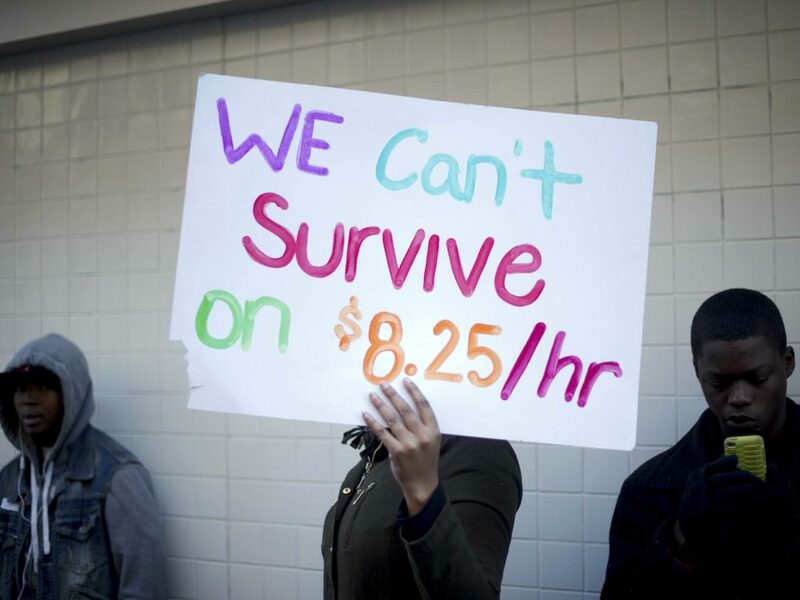 The US federal minimum wage has been $US 7.25 per hour for almost a decade. A full-time minimum wage job pays about $US 15,000 a year. It is impossible to live with independence, security and dignity on that wage, even for a single adult with no dependents. In the UK, and especially in Australia, statutory minimum wages are well above the US level, but even in Australia, the minimum wage is not high enough to be a just social wage. This is obvious, if we look back to the days before neoliberalism had taken hold. The last thing anyone would have expected in about 1970 is that the lowest paid workers in each of these countries would have seen their relative positions deteriorate over the next fifty years, and yet this is exactly what has happened. The real minimum wage in the USA in 2016 was 27% below its 1970 level. In an economy which has for many years been productive enough to end poverty for good, millions of people have been left in financial hardship, for reasons rooted not in economics, but in ideology. 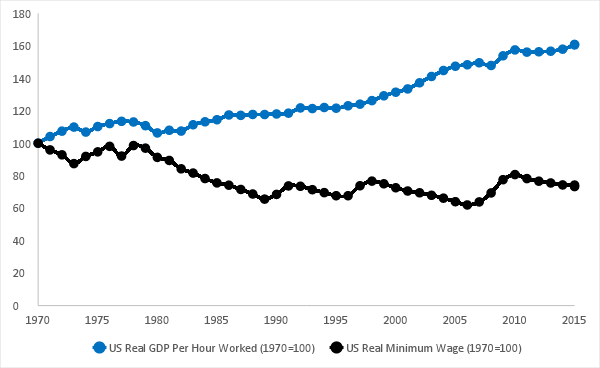 To raise the real federal minimum wage in line with increases in US labour productivity, the wage should now be about $US 16 per hour, and over $US 33,000 a year. In other words, the federal minimum wage needs to be more than doubled. Turning in Figure 2 to the case of Australia, things look rather little better for the lowest paid, than they do in the US, but they still don’t look entirely fair. 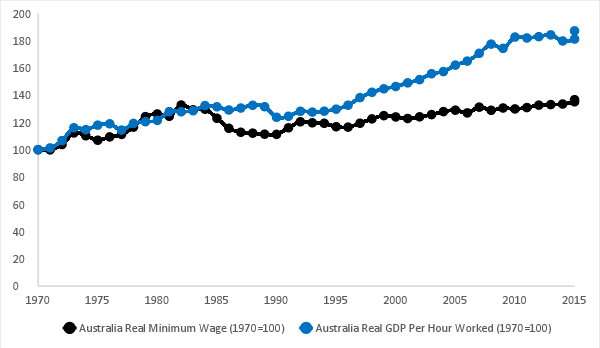 In Australia, for the lowest paid to have maintained their relative position from 1970 would have required a minimum annual wage in full-time employment of about AUD 47,000 in 2016, which is close to $A 24 an hour. Australia needs to increase its minimum by more than 30%. In terms of spending power, $A 24 is about the same as $US 16. The case of the UK is shown in Figure 3. 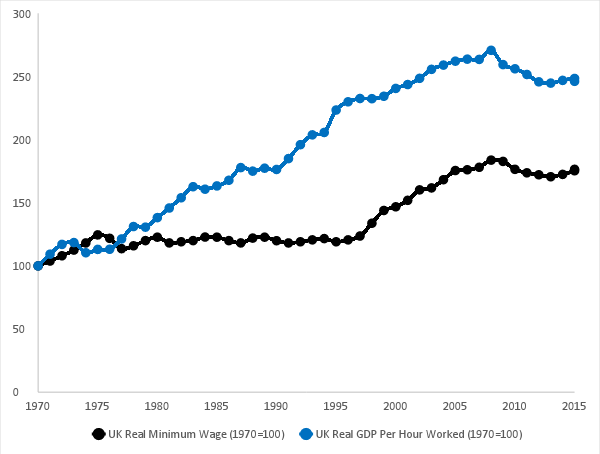 Taking productivity per hour worked into account, a just full-time minimum wage in the UK by 2017 would have been about ₤20,000. This equates to an hourly rate of ₤ 9.50, or $US 13.70. It is slightly lower than for the USA or Australia, since the UK is a lower productivity economy. Nonetheless, it involves a more than 25% increase in the UK’s national minimum living wage. 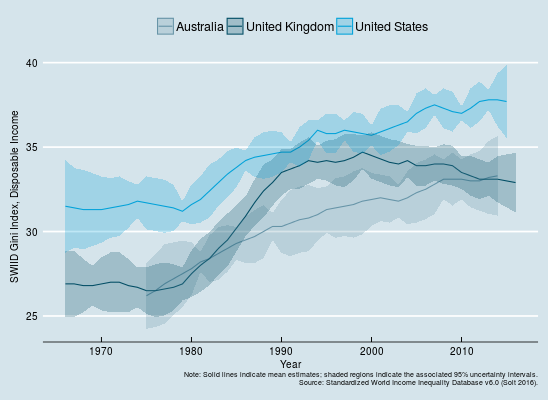 Australia and the UK have since 1980 become more unequal societies than even the USA was in the 1970s, and inequality in the USA has increased to a level comparable with that of a low-income country dictatorship. All this must be reversed. This is shown in Figure 4, which is based on the best internationally comparable data, with an increase in the so-called Gini statistic equating to an increase in inequality. An essential tool for restoring the relative position of low income groups in all these societies must be a significant, and in the case of the USA very dramatic, increase in national minimum wage rates. However, the minimum wage isn’t the minimum at all if you are in an excluded occupation, young, unemployed or underemployed. For a radical increase in the statutory minimum wage rate in a country to transform the lives of the lowest paid, it must be combined with a guarantee of employment at that minimum wage. A job guarantee at the minimum social wage is a requirement for a just and sustainable society. That job guarantee should set a minimum socially acceptable floor for wages and working conditions, eliminate involuntary unemployment, contribute towards the elimination of involuntary poverty, and play a major part in reducing income inequality. We know that involuntary unemployment, underemployment and insecure employment have major negative consequences on well-being over and above any loss of income. We know that healthy societies, by a variety of metrics, are more equal and equitable ones, rather than those with the highest average incomes. We know a job guarantee is affordable in all three countries. We know there is a great deal of work to be done. We are not short of ideas and plans. Many of us also believe the range of activities deemed worthy of remuneration should be extended. We know the minimum wage is inadequate in the UK and Australia. We know it is a national disgrace in the USA. In US dollars, the US and Australia should have legal minimum wage rates of at least $16 an hour. In the UK, that minimum should be close to US$14 an hour. In local currency terms, the minimum should be ₤9.50 in the UK and $A24 in Australia. The real value of this minimum social wage should be set immediately at a level which restores to the low paid their fair share of national income distribution, accounting for increases in both the cost of living and the benefits of technological change and rising labour productivity over the past half-century. It should not be seen as a mechanism to keep wages down, as is the case with the threat of unemployment at the moment. Instead, the goal should be to raise the relative wage of the low paid, and by doing so to engineer a much greater degree of income equality. Any inflationary consequences should be negated by an increase in tax rates on those at the top of the wealth distribution, to create space for the low paid to spend more out of their higher incomes, without pushing the economy beyond its productive capacity. A movement towards a more progressive tax system, such as the one which existed fifty years ago, alongside a radical increase in real minimum wages rates, supported by a job guarantee, would play a major part in a transition to a future of sustainable prosperity. This piece is an edit which was originally published in full by the Binzagr Institute and was reproduced with permission of the author. I think a guaranteed social wage for all, globally, is where the convesation has to lead. would be very wary of having a sleep over with JMK, a very marginal person! Economics was seriously out of line with reality in the 1930s, useless , destructive nonsense. Keynes, sadly, rescued the market dogma, and later Hayek’s gangs dragged the world’s economics back to the retarded economics of the English ( such as Malthus, Ricardo). I would rather have a sleep over and learn from Adam Smith (Scottish/French economics), better yet the German List), or the best economist, the Americans Hamilton, Carey, Clay. Until ‘the left’ study those economists, they will be impotent in political economy. Thomas Paine’s economic writings on wage justice are also worth a visit. 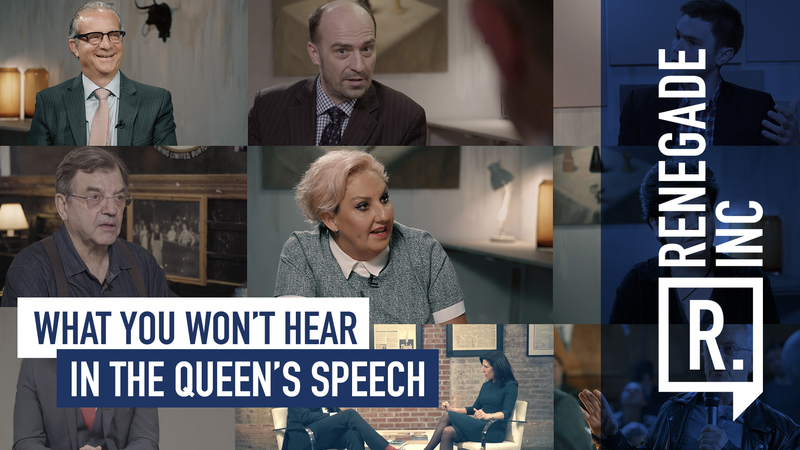 As a busy year draws to a close we want to look back at those people who've inspired and enlightened us in 2017. Coming up this week is the first of two shows we take a whistle-stop tour around the thinkers, writers, doers and Renegade types we met during 2017. Tune into Renegade Inc on RTUK, on Monday the 25th of December at 7.30am, 1.30pm, and 6.30pm, or stay glued to the website for upcoming episodes.